The final of the AESS Patricia Routledge National English Song Competition was held at the Royal Academy of Music on Wednesday 2nd May in the presence of Miss Routledge to whom we are indebted. The judges were Jonathan Courage, Norbert Meyn, Mary Mogil, Elizabeth Ritchie and Rosamund Shelley. Thanks are due to them. Jonathan and Mary also selected the finalists at the preliminary round ably assisted by our marvellous co-ordinator Stephen Miles, who masterminded the logistics of the final impeccably as always. The winner of the £2000 first prize was Hadleigh Adams, bass-baritone, who studies with Janice Chapman at the Guildhall School of Music and Drama. His accompanist, Catherine Norton won the £1000 prize. The judges awarded joint second place to Eleanor Garside, studying with Thomas Shultz and Caroline Crawshaw at the Royal Northern College of Music and Alexei Winter, a private student of AESS member Angela Hickey in Bristol. They both won £1000. Miss Routledge spoke and presented the prizes after Jonathan Courage had spoken on behalf of the Panel. Thanks are due to Rob Wilding, Mark Wildman and the Principal of the Royal Academy of Music for allowing the use of the College free of charge in recognition of the importance of improving the communication of young performers in both speech and song. 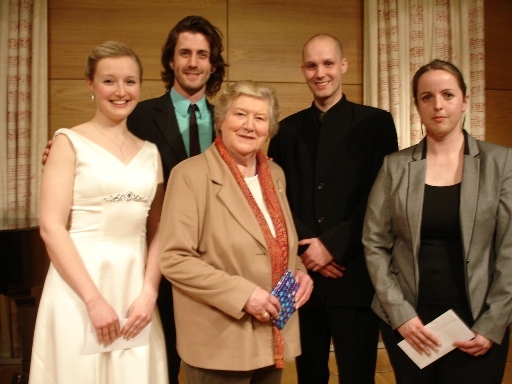 The photograph shows Patricia Routledge CBE with the winners of the competition. Eleanor Garside, Hadleigh Adams, Alexei Winter and Catherine Norton. This entry was posted in Past Events on May 2, 2012 by AESS.